There’s a handsome former industrial building on Northdown Street that has recently acquired beckoning, warmly luminous signage. It reads: The Invisible Dot, and it has done its job of coming over all enigmatic and luring me in to check out a show. The Invisible Dot partly sells itself as the first custom-built comedy venue to open in London in over 20 years. On the dark street I’m directed in through the giant garage doors on the dark street, to be immediately faced by a utilitarian bar, 60 hemmed-in seats, and the tiny stage beyond. A crowd mercifully measuring only about a six or seven on the hipster scale is gathering for “The Movies” a mix of short films and “offcuts” stitched together with stand-up. Sounds good to me. The comedian Will Andrews hosts the show, with his rambling schtick, his references to his mother-in-law-bought jumper and his self-deprecating tales of film script rejection. He shows us a number of his bizarre abandoned pilots and spinoff shorts, including one made of only film-shoot clapperboard clacks and the most charming showing a number of blokes all about to climb ladders in the build-up intro to Young Hearts Run Free. Men Climbing Ladders to Disco then ends as the singing begins – everyone is audibly gutted. 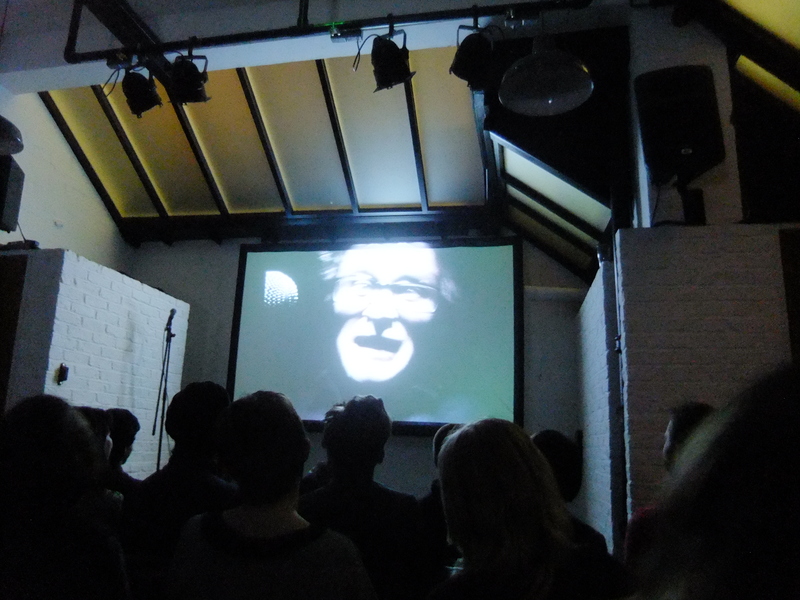 The oddball offcut feel continues, with the headline act, Simon Munnery, delivering his performance from behind the audience via CCTV projected to the screen in front – this is sit-down stand-up, no? He switches between his weirdly lit face and a camera pointing at a desk, where he unfolds a puppet show of scrappy paper drawings and cutouts. Like a one-man Have I Got News for You, Munnery flashes up headlines such as “Media to blame enquiry finds media to blame” “Gay men on verge of self-parody” “If you do just one thing today – it just might not be enough” as well as visual gags involving Venn diagrams and puppies in hats. His silly and beguiling images send the audience into the desired fits of lolz. It’s enough of a night for an intermission: a mesmerising video of a giant shredder devouring everything from trainers to pillows, big tins of paint to bits of furniture, like some sort of QVC-inspired hell, with muzak to match. Tom Kingsley and Will Sharpe, looking very much their 26 years (each, not combined), get up on stage to talk about their feature-length dark comedy, Black Pond, which they made a year ago for £25,000. They are definitely dining out on their tales of naïveté, but are compelling all the same. There’s time for a few more flicks, including The Voorman Problem, a 13-min film starring Martin Freeman in which he psychoanalyses a prisoner who proves he is God by making Belgium disappear. The host returns to introduce collated footage of a dog repeatedly evading capture on a motorway, with For Today I Am a Boy by Antony and the Johnsons as the soundtrack. A lovely melancholy end. 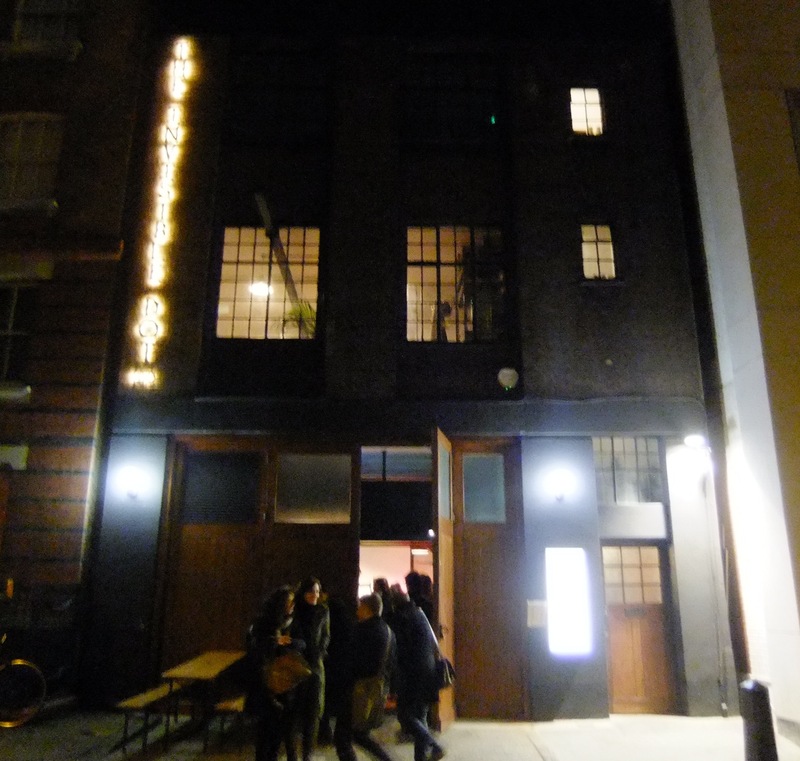 The Invisible Dot, established in 2009, moved from a Camden market stable a few months ago into a more suitable home for its mix of stand-up, cabaret and film. Every event gets an ID number, which seems to fit with the archival, artsy and experimental feel of the whole enterprise. The organisers say that King’s Cross has a “spring in its step” from a new injection of exciting organisations, and is removed from the stifle of proper central London. This entry was posted in Arts and Entertainment and tagged arts venue, Comedy, Entertainment, live acts, N1, Northdown Street, stand-up comedy, The Invisible Dot. Bookmark the permalink. I saw Simon Amstell there and was really impressed with it too. They seem to have established it as a place for well-known comedians to try out new stuff, which is a great chance to see them in an intimate venue.